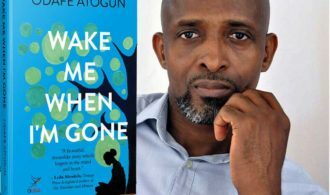 Odafe Atogun’s second novel Wake Me When I’m Gone, published by Canongate, is available for your reading pleasure. In Nigeria, it is published by Ouida Books. Odafe Atogun’s first novel Taduno’s Song made its debut in the African literary scene when it launched at the Ake Festival 2016 with none other than Ngugi Wa Thiong’o in attendance. The book, published in Nigeria by Ouida Books, followed the story of Taduno a musician who stands against the oppressive country he lives in to the detriment of his career. That character was loosely based on legendary Nigerian musician Fela Kuti who stood against the military dictatorships that misruled Nigeria for many moons. It would go on to be longlisted for the 9mobile Prize for Literature 2018. Everyone says that Ese is the most beautiful woman in the region, but a fool. A young widow, she lives in a village, where the crops grow tall and the people are ruled over by a Chief on a white horse. She married for love, but now her husband is dead, leaving her with nothing but a market stall and a young son to feed. When the Chief knocks on Ese’s door demanding that she marry again, as the laws of the land dictate she must, Ese is a fool once more. There is a high price for breaking the law, and an even greater cost for breaking the heart of a Chief. Ese will face the wrath of gods and men in the fight to preserve her heart, to keep her son and to right centuries of wrongs. She will change the lives of many on the road to freedom, and she will face the greatest pain a mother ever can. Wake Me When I’m Gone is a story of curses broken and lives remade, of great tragedy and incredible rebirth. In this, his second novel, Nigerian writer Odafe Atogun unfolds a world rich with tradition and folklore, a world filled with incredible people of remarkable strength, a world that is changing fast. It is be published in Nigeria by Ouida Books. You can read more about the book here.